Critical Link (4-180) will showcase its latest board-level solutions at Embedded World. 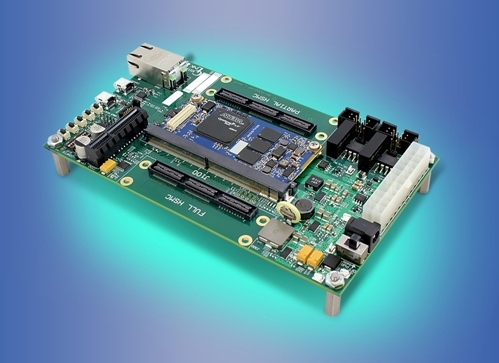 The MitySOM-A10S is the newest addition to the company’s line of industrial embedded modules. The system on module (SOM) family is designed with the Intel/Altera Arria 10 SoC, which features dual core Cortex-A9 Arms and up to 480KLE user-programmable FPGA fabric. In addition to the processor, the module includes on-board power supplies, two DDR4 RAM memory subsystems, micro SD card, a USB 2.0 on-the-go port, and a temperature sensor. Multiple configurations are available to meet requirements for a wide range of applications in industrial, medical, broadcast, utilities, defence, and other markets. The MitySOM-5CSx family, based on the Intel/Altera Cyclone V SoC processor, will also be on display. It will be demonstrated live as part of the company’s embedded vision development kit featuring Bcon Dart camera modules from Basler.